Jo McDaniels has an unusual gift, a special tool she uses in her job. Jo is an FBI profiler with the ability to sense what victims felt prior to death; not only their emotions, but their pain as well. Sheriff Austin Garrett is willing to try anything to catch the vicious serial killer decapitating victims in his jurisdiction. He's never faced such a monster and is happy to accept FBI help, particularly from this beautiful, sassy agent. Working together, they come closer to the killer with each body - but will the monster change the game and decide Jo would be the ultimate kill? 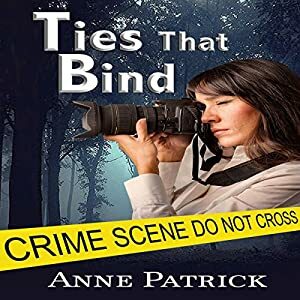 Ties that Bind was difficult to put down and I would highly recommend it to all fans of romantic suspense or murder mysteries. The way in which the killer goes about selecting and killing his victims is both chilling and creepy. The only downside was that I figured out too early in the story who the killer was. The attempt to throw suspicion in a different direction towards the end of the novel came too late and it just didn't convince me. Despite this I enjoyed the serial killer storyline and the whole process the police went through in order to catch him. But, what I liked most was Jo and her story. She is a very interesting and well written character. The fact that she is an FBI profiler is an interesting aspect of her life in itself but she also has a rocky relationship with her family which plays a big part in the story. I loved the fact that she had a psychic connection to the murders and we got to see into the minds of the victims as well as the killer. There is also a little bit of romance involved as Jo and Sheriff Austen become friendly. I liked that it was only a small aspect of the story and not overdone as the writer focused more on the murder mystery plot. Leonor A Woodworth is very easy to listen to and she does a fantastic job of narrating Ties that Bind. She did a great job of portraying male and female characters and she gets across their emotions very well. This is the second of Leonor's productions that I have listened to and I have been impressed both times. I received a copy via audiobookblast.com in exchange for an honest review.